Eratosthenes of Cyrene (; Greek: Ἐρατοσθένης, IPA: ; c. 276 BC – c. 195/194 BC) was a Greek mathematician, geographer, poet, astronomer, and music theorist. He was a man of learning, becoming the chief librarian at the Library of Alexandria. He invented the discipline of geography, including the terminology used today. He is best known for being the first person to calculate the circumference of the Earth, which he did by applying a measuring system using stades, or the length of stadia during that time period. His calculation was remarkably accurate. He was also the first to calculate the tilt of the Earth's axis (again with remarkable accuracy). Additionally, he may have accurately calculated the distance from the Earth to the Sun and invented the leap day. He created the first map of the world incorporating parallels and meridians, based on the available geographical knowledge of the era. He was a figure of influence who declined to specialize in only one field. According to an entry in the Suda (a 10th-century reference), his critics scorned him, calling him Beta, from the second letter of the Greek alphabet, because he always came in second in all his endeavors. Nonetheless, his devotees nicknamed him Pentathlos, after the Olympians who were well rounded competitors, for he had proven himself to be knowledgeable in every area of learning. Eratosthenes yearned to understand the complexities of the entire world. Seventeen hundred years after Eratosthenes' death, while Christopher Columbus studied what Eratosthenes had written about the size of the Earth, he chose to believe that the Earth's circumference was much smaller. Had Columbus set sail knowing that Eratosthenes' larger circumference value was more accurate, he would have known that the place where he made landfall was not Asia, but rather a New World. The son of Aglaos, Eratosthenes was born in 276 BC, in Cyrene. Now part of modern-day Libya, Cyrene had been founded by the Greeks centuries earlier, and became the capital of Pentapolis (North Africa), a country of five cities: Cyrene, Arsinde, Berenice, Ptolemias, and Apollonia, Cyrenaica. Alexander the Great conquered Cyrene in 332 BC, and following his death in 323 BC its rule was given to one of his generals, Ptolemy I Soter, the founder of the Ptolemaic Kingdom. Under Ptolemaic rule the economy prospered, based largely on the export of horses and silphium, a plant used for rich seasoning and medicine. Cyrene became a place of cultivation, where knowledge blossomed. Like any young Greek, Eratosthenes would have studied in the local gymnasium, where he would have learned physical skills and social discourse as well as reading, writing, arithmetic, poetry, and music. Eratosthenes went to Athens to further his studies. There he was taught Egyptian Thebes. Eratosthenes also wrote Olympic Victors, a chronology of the winners of the Olympic Games. It is not known when he wrote his works, but they highlighted his abilities. These works and his great poetic abilities led the pharaoh Ptolemy III Euergetes to seek to place him as a librarian at the Library of Alexandria in the year 245 BC. Eratosthenes, then thirty years old, accepted Ptolemy's invitation and traveled to Alexandria, where he lived for the rest of his life. Within about five years he became Chief Librarian, a position that the poet Apollonius Rhodius had previously held. As head of the library Eratosthenes tutored the children of Ptolemy, including Ptolemy IV Philopator who became the fourth Ptolemaic pharaoh. He expanded the library's holdings: in Alexandria all books had to be surrendered for duplication. It was said that these were copied so accurately that it was impossible to tell if the library had returned the copy or the original. 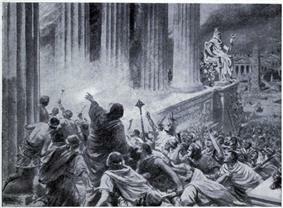 He sought to maintain the reputation of the Library of Alexandria against competition from the Pergamum. Eratosthenes created a whole section devoted to the examination of Homer, and acquired original works of great tragic dramas of Aeschylus, Sophocles and Euripides. Eratosthenes made several important contributions to mathematics and science, and was a friend of Archimedes. Around 255 BC, he invented the armillary sphere. In On the Circular Motions of the Celestial Bodies, Cleomedes credited him with having calculated the Earth's circumference around 240 BC, using knowledge of the angle of elevation of the Sun at noon on the summer solstice in Alexandria and on Elephantine Island near Syene (now Aswan, Egypt). Eratosthenes believed there was good and bad in every nation and criticized Aristotle for arguing that humanity was divided into Greeks and barbarians, and that the Greeks should keep themselves racially pure. As he aged he contracted ophthalmia, becoming blind around 195 BC. Losing the ability to read and to observe nature plagued and depressed him, leading him to voluntarily starve himself to death. He died in 194 BC at the age of 82 in his beloved Alexandria. Illustration showing a portion of the globe showing a part of the African continent. The sunbeams shown as two rays hitting the ground at Syene and Alexandria. Angle of sunbeam and the gnomons (vertical sticks) is shown at Alexandria which allowed Eratosthenes' estimates of radius and circumference of Earth. Eratosthenes calculated the circumference of the Earth without leaving Egypt. Eratosthenes knew that at local noon on the summer solstice in the Ancient Egyptian city of Swenet (known in ancient Greek as Syene, and now as Aswan) on the Tropic of Cancer, the Sun would appear at the zenith, directly overhead. He knew this because he had been told that the shadow of someone looking down a deep well in Syene would block the reflection of the Sun at noon off the water at the bottom of the well. Using a gnomon, he measured the Sun's angle of elevation at noon on the solstice in Alexandria, and found it to be 1/50th of a circle (7°12') south of the zenith. He may have used a compass to measure the angle of the shadow cast by the Sun. Assuming that the Earth was spherical (360°), and that Alexandria was due north of Syene, he concluded that the meridian arc distance from Alexandria to Syene must therefore be 1/50th of a circle's circumference, or 7°12'/360°. That Alexandria and Syene lie on the same meridian. That the distance between Alexandria and Syene is 5000 stades. That the Earth is a sphere. If we repeat Eratosthenes' calculation with more accurate data, the result is 40,074 km, which is 66 km different (0.16%) from the currently accepted circumference of the Earth. Eratosthenes continued from his knowledge about the Earth, his discoveries of its size and shape, and began to sketch it. In the Library of Alexandria he had access to various travel books, which contained various items of information and representations of the world that needed to be pieced together in some organized format. In his three-volume work Geographika, he described and mapped his entire known world, even dividing the Earth into five climate zones: two freezing zones around the pole, two temperate zones, and a zone encompassing the equator and the tropics. He had invented geography. He created terminology that is still used today. He placed grids of overlapping lines over the surface of the Earth. He used parallels and meridians to link together every place in the world. It was now possible to estimate one's distance from remote locations with this network over the surface of the Earth. In Geographika the names of over 400 cities and their locations were shown: this had never been achieved before. Unfortunately Geographika has been lost to history, but fragments of the work can be pieced together from other great historians like Pliny, Polybius, Strabo, and Marcianus. His third book of Geographika contained political geography. He cited countries and used parallel lines to divide the map into sections, to give accurate descriptions of the realms. This was a breakthrough, and can be considered the beginning of geography. 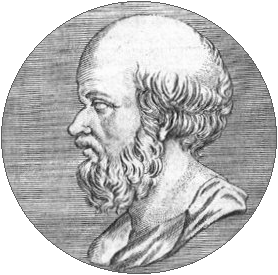 Eratosthenes was described by the Suda Lexicon as a Πένταθλος (Pentathlos) which can be translated as "All-Rounder", for he was skilled in a variety of things: He was a true polymath. He was nicknamed Beta, because he was great at many things and tried to get his hands on every bit of information, but never achieved the highest rank in anything, so much so that Strabo accounts Eratosthenes as a mathematician among geographers, and a geographer among mathematicians. Eusebius of Caesarea in his Preparatio Evangelica includes a brief chapter of three sentences on celestial distances (Book XV, Chapter 53). He states simply that Eratosthenes found the distance to the Sun to be "σταδίων μυριάδας τετρακοσίας καὶ ὀκτωκισμυρίας" (literally "of stadia myriads 400 and 80,000") and the distance to the Moon to be 780,000 stadia. The expression for the distance to the Sun has been translated either as 4,080,000 stadia (1903 translation by E. H. Gifford), or as 804,000,000 stadia (edition of Edouard des Places, dated 1974–1991). The meaning depends on whether Eusebius meant 400 myriad plus 80,000 or "400 and 80,000" myriad. With a stade of 185 meters, 804,000,000 stadia is 149,000,000 kilometers, approximately the distance from the Earth to the Sun. ^ a b c How did Eratosthenes measure the circumference of the Earth? ^ Eratosthenes and the Mystery of the Stades – How Long Is a Stade? Bulmer-Thomas, Ivor (1939–1940). Selections Illustlating the History of Greek Mathematics. Cambridge, MA: Harvard University Press. Cameron McPhail (2011). . A Thesis Submitted for the Degree of Master of Arts at the University of OtagoReconstructing Eratosthenes' Map of the World: a Study in Source Analysis. Dunedin, New Zealand. Dutka, J. (1993). "Eratosthenes' measurement of the Earth reconsidered". Arch. Hist. Exact Sci. 46 (1): 55–66. El'natanov, B. A. (1983). "A brief outline of the history of the development of the sieve of Eratosthenes". Istor.-Mat. Issled. (in Russian) 27: 238–259. Fowler, D. H.; Rawlins, Dennis (1983). "Eratosthenes' ratio for the obliquity of the ecliptic". Isis 74 (274): 556–562. Goldstein, B. R. (1984). "Eratosthenes on the "measurement" of the Earth". Historia Math. 11 (4): 411–416. Gulbekian, E. (1987). "The origin and value of the stadion unit used by Eratosthenes in the third century B.C". Manna, F. (1986). "The Pentathlos of ancient science, Eratosthenes, first and only one of the "primes"". Atti Accad. Pontaniana (N.S.) (in Italian) 35: 37–44. Nicastro, Nicholas (2008). Circumference: Eratosthenes and the ancient quest to measure the globe. New York: St. Martin's Press. Rawlins, D. (1982). 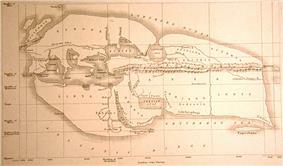 "Eratosthenes' geodesy unraveled : was there a high-accuracy Hellenistic astronomy". Isis 73 (2): 259–265. Rawlins, D. (2008). "Eratosthenes's large Earth and tiny universe" (PDF). DIO 14: 3–12. Roller, Duane W. (2010). Eratosthenes' Geography: Fragments collected and translated, with commentary and additional material. Princeton: Princeton University Press. Taisbak, C. M. (1984). "Eleven eighty-thirds. Ptolemy's reference to Eratosthenes in Almagest I.12". Centaurus 27 (2): 165–167. 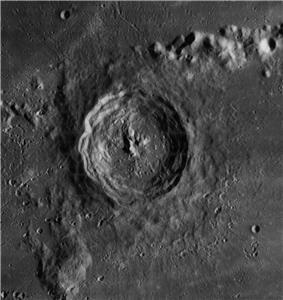 Following in the footsteps of Eratosthenes : project La main à la pâte.